I feel like my arm is all warmed up and I don’t have a game to pitch. I was primed to review "Atlas Shrugged." I figured it might provide a parable of Ayn Rand’s philosophy that I could discuss. For me, that philosophy reduces itself to: "I’m on board; pull up the lifeline." There are however people who take Ayn Rand even more seriously than comic-book fans take "Watchmen." I expect to receive learned and sarcastic lectures on the pathetic failings of my review. And now I am faced with this movie, the most anticlimactic non-event since Geraldo Rivera broke into Al Capone’s vault. I suspect only someone very familiar with Rand’s 1957 novel could understand the film at all, and I doubt they will be happy with it. For the rest of us, it involves a series of business meetings in luxurious retro leather-and-brass board rooms and offices, and restaurants and bedrooms that look borrowed from a hotel no doubt known as the Robber Baron Arms. During these meetings, everybody drinks. More wine is poured and sipped in this film than at a convention of oenophiliacs. There are conversations in English after which I sometimes found myself asking, "What did they just say?" The dialogue seems to have been ripped throbbing with passion from the pages of Investors’ Business Daily. Much of the excitement centers on the tensile strength of steel. The story involves Dagny Taggart (Taylor Schilling), a young woman who controls a railroad company named Taggart Transcontinental (its motto: "Ocean to Ocean"). She is a fearless and visionary entrepreneur, who is determined to use a revolutionary new steel to repair her train tracks. Vast forces seem to conspire against her. It’s a few years in the future. America has become a state in which mediocrity is the goal, and high-achieving individuals the enemy. Laws have been passed prohibiting companies from owning other companies. Dagny’s new steel, which is produced by her sometime lover, Hank Rearden (Grant Bowler), has been legislated against because it’s better than other steels. The Union of Railroad Engineers has decided it will not operate Dagny’s trains. Just to show you how bad things have become, a government minister announces "a tax will be applied to the state of Colorado, in order to equalize our national economy." So you see how governments and unions are the enemy of visionary entrepreneurs. But you’re thinking, railroads? Yes, although airplanes exist in this future, trains are where it’s at. When I was 6, my Aunt Martha brought me to Chicago to attend the great Railroad Fair of 1948, at which the nation’s rail companies celebrated the wonders that were on the way. They didn’t quite foresee mass air transportation. "Atlas Shrugged" seems to buy into the fair’s glowing vision of the future of trains. Rarely, perhaps never, has television news covered the laying of new railroad track with the breathless urgency of the news channels shown in this movie. Oh, and there is Wisconsin. Dagny and Hank ride blissfully in Taggart’s new high-speed train, and then Hank suggests they take a trip to Wisconsin, where the state’s policies caused the suppression of an engine that runs on the ozone in the air, or something (the film’s detailed explanation won’t clear this up). They decide to drive there. That’s when you’ll enjoy the beautiful landscape photography of the deserts of Wisconsin. My advice to the filmmakers: If you want to use a desert, why not just refer to Wisconsin as "New Mexico"? 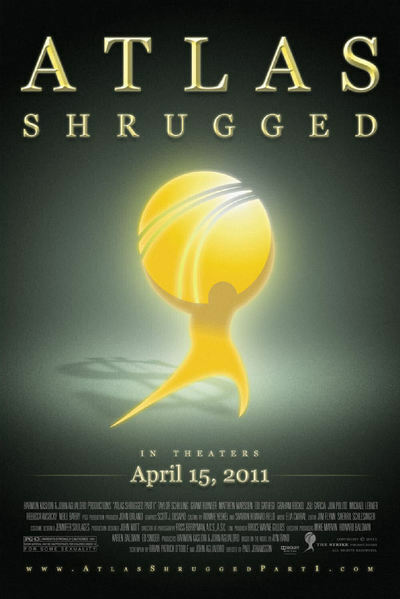 "Atlas Shrugged" closes with a title card saying, "End of Part 1." Frequently throughout the film, characters repeat the phrase, "Who is John Galt?" Well they might ask. A man in black, always shot in shadow, is apparently John Galt. If you want to get a good look at him and find out why everybody is asking, I hope you can find out in Part 2. I don’t think you can hold out for Part 3. My mighty hammering over "Thor"